Yes, that’s right, Monte Camicia – or Shirt Mountain. Why name a mountain after an item of gentlemen’s clothing? 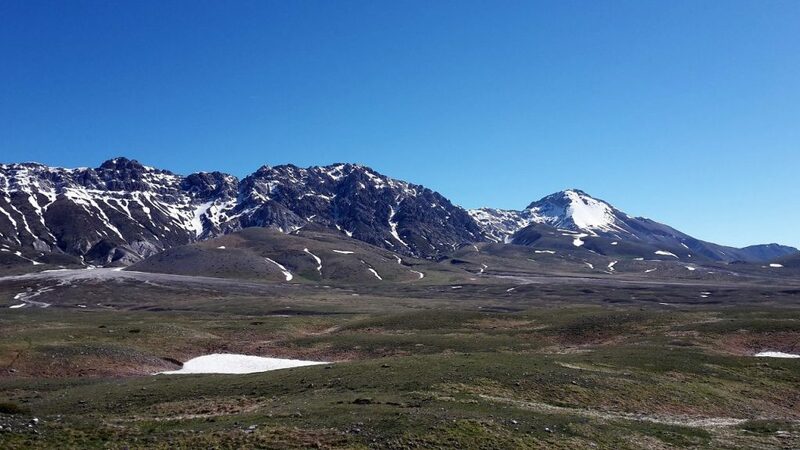 I’ve been unable to find out the true reason, but a clue was offered as we drove across the southern side of Campo Imperatore, the great high-altitude plateau that is bounded by many of the high peaks of Gran Sasso. 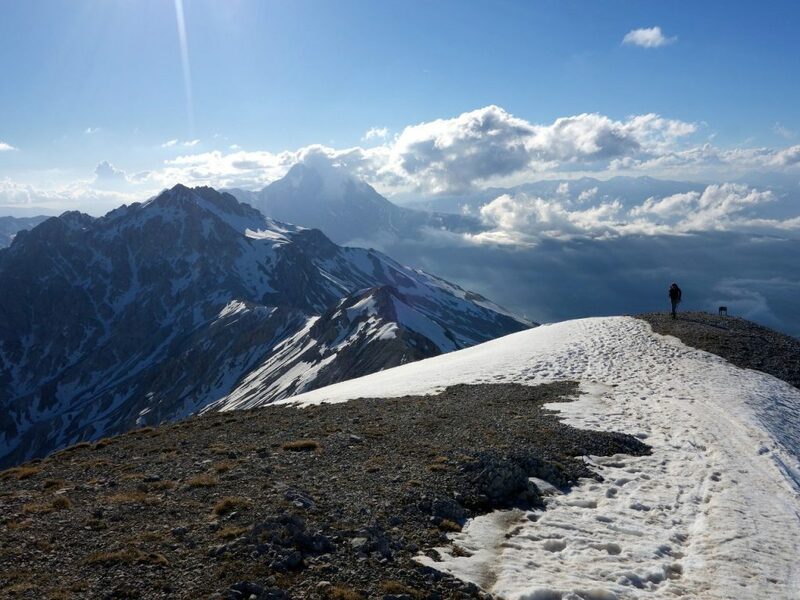 Monte Camicia lies at the eastern end of a jagged 20km ridge, the Cresta Orientale, that stretches from the waist of Corno Grande (2,912m), the highest mountain in Italy’s Apennines, looking out over the Adriatic Sea. The ridge contains a number of peaks over 2,000m, and I’m told told that parts of it are a technical rock climb. It certainly looks like a hell of a rock scramble to rival the Cuillin Ridge on Skye. Monte Camicia’s north face is one of the highest rock walls in the Apennines, rising over 1,200m above the foothills. It has been climbed in its entirety only about a dozen times since its first ascent in 1934. Not a route for me, but from the southern Campo Imperatore side, there are some more feasible walking routes and scrambles. 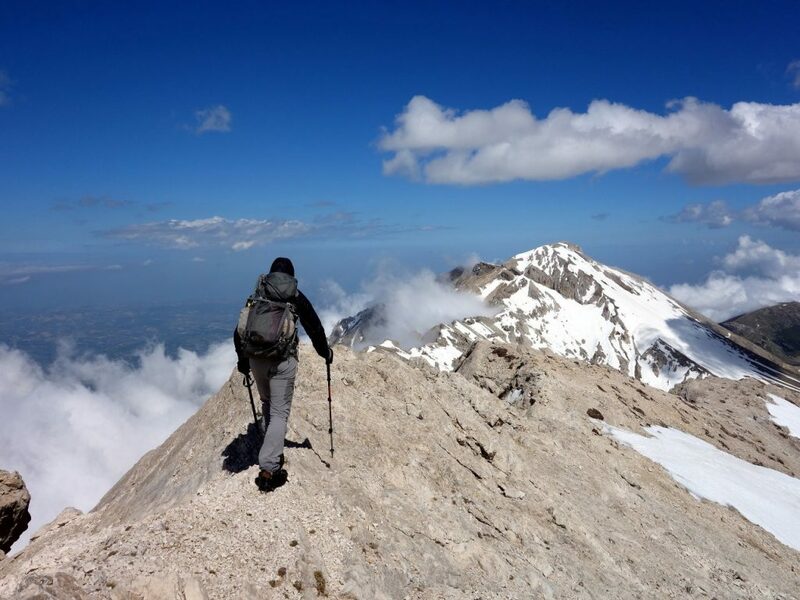 We aimed to climb the two highest peaks on the ridge, Monte Prena (2,561m) and Monte Camicia (2,564m), by ascending to a col, the Vado di Ferruccio between the two, scrambling up Prena, then returning to the col to traverse over Camicia. Camicia itself was unfinished business for Edita. She set off to climb it from the eastern side with an Italian walking group a couple of years ago, but they had to retreat in a temporale (thunderstorm) a few metres short of the summit ridge. 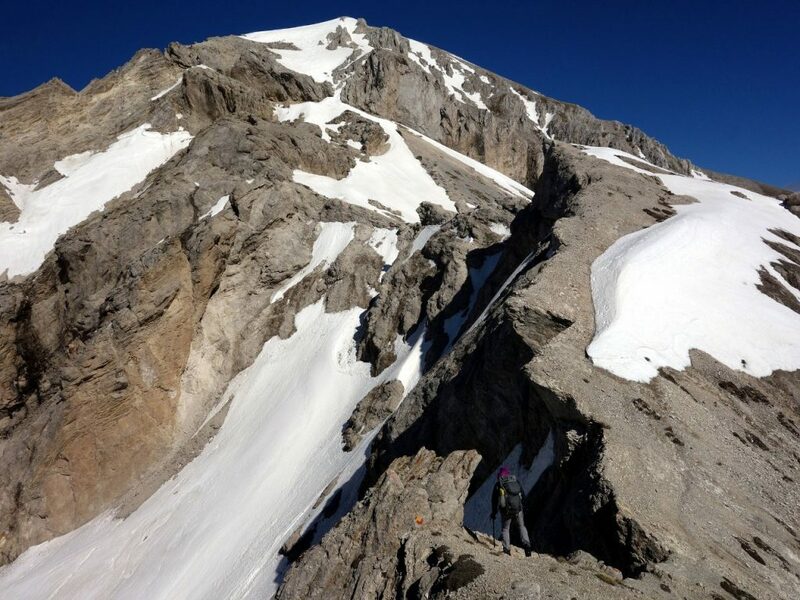 It was mid-May when we climbed it, and while most of the Cresta Orientale, including the jagged Monte Prena, was only lightly streaked with snow in the late spring heat, Monte Camicia still wore an extensive mantle of winter white. Perhaps this is how it came by its curious name. I’ve mentioned before how the excellent Cicerone guidebook Walking in Abruzzo introduced us to the mountains of the Central Apennines. We’ve done some great walks from it, both gentle and strenuous. 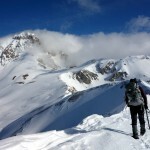 This one was described as “a serious and memorable trip with more of a mountaineering feel than any other in the guide”. That was all we needed to save it for a day with a perfect weather forecast and lick our lips in anticipation. I was licking my lips so much that I dribbled down my shirt (sorry, I’ll try not to make too many shirt jokes in this post, but it’s going to be hard). We managed to make it even more mountainous by climbing the two mountains on the fringes of winter. The previous week I had sodden feet after wearing trail shoes on Pizzo di Sevo. This time there was no question of us not wearing our big waterproof walking boots. We were going to need ice axe and crampons on this trip for sure. 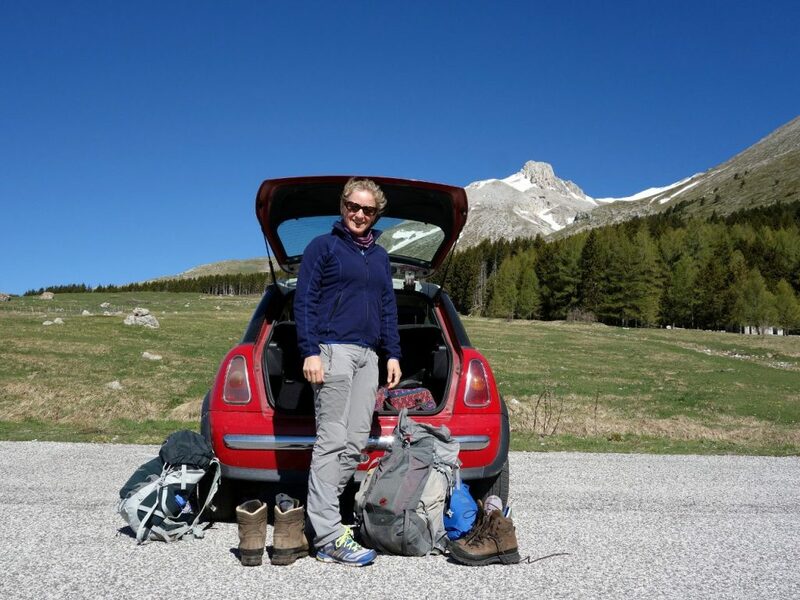 There was still snow on Monte Camicia, but even so we were surprised to see skiers when we parked at Fonte della Vetica, a large car park at 1,600m in the north-east corner of Campo Imperatore. Surely on a day like this they would be indulging in the art of Scottish skiing, where the protagonist’s journey down the slope is interrupted by a large patch of heather, before resuming its smoother passage on the other side? But we soon discovered there was more snow than we thought. There were also two large camper vans parked opposite our car, which were still there when we returned many hours later. We started by skirting the southern side of Monte Camicia on trackless grassy slopes, to gain access to the col between the two peaks. Rising to the east we could see the giant plateau of Maiella and its highest peak, Monte Amaro, a huge area still extensively snow-capped. We stopped at some abandoned mine buildings on the south side to have breakfast of banana and chocolate cornetto (croissant). This was a new idea of Edita’s and it proved a success. It prevented the pre-summit energy slump that I’ve experienced on our previous climbs together when I’ve tried to keep up with her. Shortly after this we joined a marked trail and turned sharply to the right to begin the steep climb up to the col. We passed some skiers on their way down, who told us this would be the ultima settimana (last week) of skiing this year. We could see other skiers much higher up on the slopes of Monte Camicia to our right, but our attention was focused on Monte Prena to our left, our first objective. 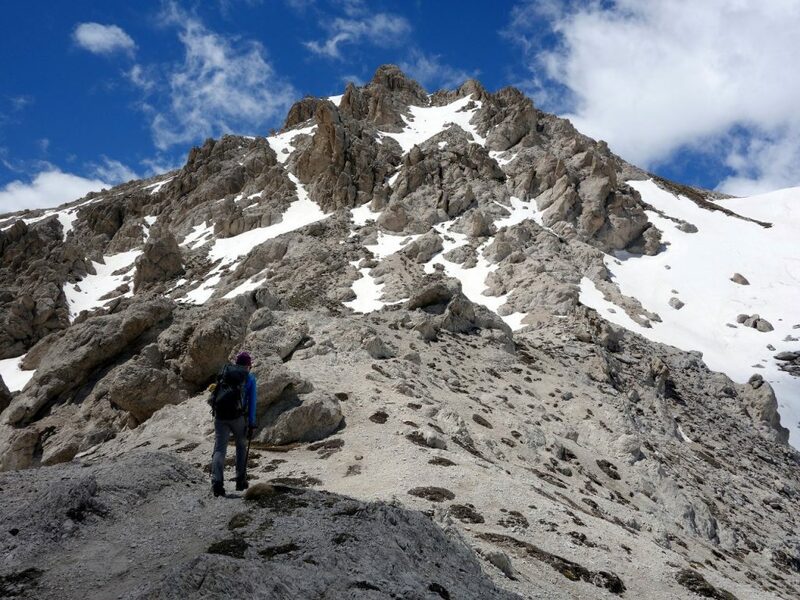 It’s a more jagged peak, a jumble of rocky buttresses, with a few icy couloirs, but no large snow fields like on Camicia, at least not on its eastern side. The snow on Camicia meant that we lost the trail for much of the way up to the col, We found ourselves breaking our own one as we traversed steeply up snow slopes. The snow was in much better condition than it had been on Pizzo di Sevo the previous week. There it had been firm and icy, a little more hazardous, but this snow was much softer. We were able to stamp big steps with our boots, and had no need for axe and crampons just yet. We continued in this fashion for most of the way up to the col, Vado di Ferruccio. On the other side there was a much bigger, sheer drop to the rolling green lowlands, with the Adriatic Sea not so far in the distance. Clouds were billowing up from below, but they were wispy, and not a threat to visibility. We turned left towards Monte Prena and walked along a broad stony ridge. We traversed beneath some pinnacles on steep snow. Ahead of us, the route up Prena looked a little unclear. The direct way would be straight up the rock buttresses at the end of the ridge. This looked quite a scramble, perhaps even a rock climb. Approaching the rocky fortress of Monte Prena. We ascended the snow slope to the right. The route description in the guidebook suggested we should skirt around to the right and ascend the final part of the mountain from the north side. That section was one large snow slope, so we decided to put on our crampons and take out our axes. This made the climbing much more straightforward. Instead of taking it gingerly, kicking big steps in the snow as we had below the col, we shot up and reached a shoulder bare of snow on the north side. From here a steeper snow slope led up to the summit ridge. It was Edita’s turn to lead, which meant I dropped a long way behind and watched her disappear up the slope. A strange feature loomed on the ridge above – a giant boulder wedged between two rock pinnacles. Hopefully it wouldn’t choose this moment to drop out. There was a final scramble up rocks to gain the ridge, from where we could see the summit cross only a few metres away. 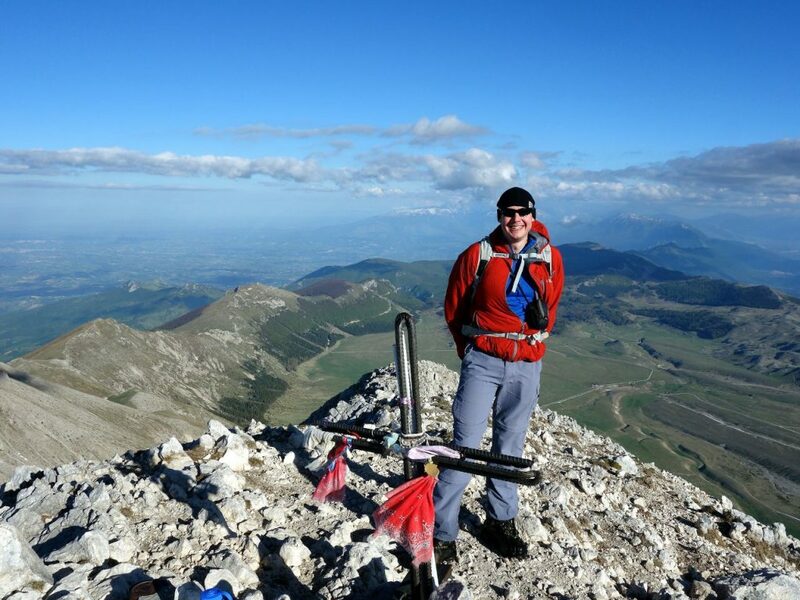 There was a real roof-of-the-world feel to that final section, with the lush green grasslands of Campo Imperatore to the south and clouds rising up from the north. To the west we could see the rest of the Cresta Orientale as far as Monte Brancastello, another 2,000er that Edita climbed with her Italian trekking group. On that occasion they looked across to Monte Prena, and her trek leader told her that it was a technical rock climb. Certainly the ridge between the two peaks looked super-challenging with many rock pinnacles barring the way. It was 3pm and we experienced a glow of satisfaction. We stopped for sandwiches. To the east, Monte Camicia rose up invitingly. Edita said it was already one of her favourite Italian climbs. How much better would it be if we traversed Camicia as well? But it was already late – should we simply return the way we had come and leave Camicia for another day? We raced down the two snow slopes back to the ridge. At the bottom of the second one Edita asked me to take a picture of her with her camera. “What sort of picture?” I asked. She promptly fell over on her back and started sliding off the mountain. She quickly turned over onto her front and dug her axe into the snow. “What on earth are you doing?” I said. I soon discovered that what she wanted was a picture of her lying blissfully in the snow. She’s just returned from several months in Chad, where temperatures were in excess of 40°C. This was a satisfying contrast. It wasn’t the safest slope for taking such a photograph, but with a little more care the second time around we managed to achieve the effect she was after. We took off our crampons to return along the ridge. It was 4pm by the time we got back to the Vado di Ferruccio. The weather was still perfect. We didn’t even discuss the choice we had to make at this point, but continued walking. 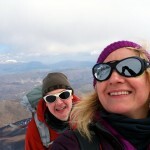 It was no choice for us; we were both keen to crown what was already a fantastic walk with a traverse of Monte Camicia. But the remainder of the ridge to Camicia looked challenging. As we looked along it from Monte Prena there appeared no obvious way up, other than keeping to the crest, which looked crinkled and scrambly (if such a word exists). Our guidebook described “exciting sections” along a “knife-edge ridge” with “one or two pulls with the hands” to “surmount a small rock band”. We could only assume that it was easier than it looked. What the route description didn’t know was that we were climbing it in late winter conditions, producing a combination of knife-edge scrambling and traverses across steep snow. We scrambled around a rock band, but the first snow slope felt a little unsafe to me in just my walking boots. Looking along the ridge I saw many such slopes, with many patches of rock in between. 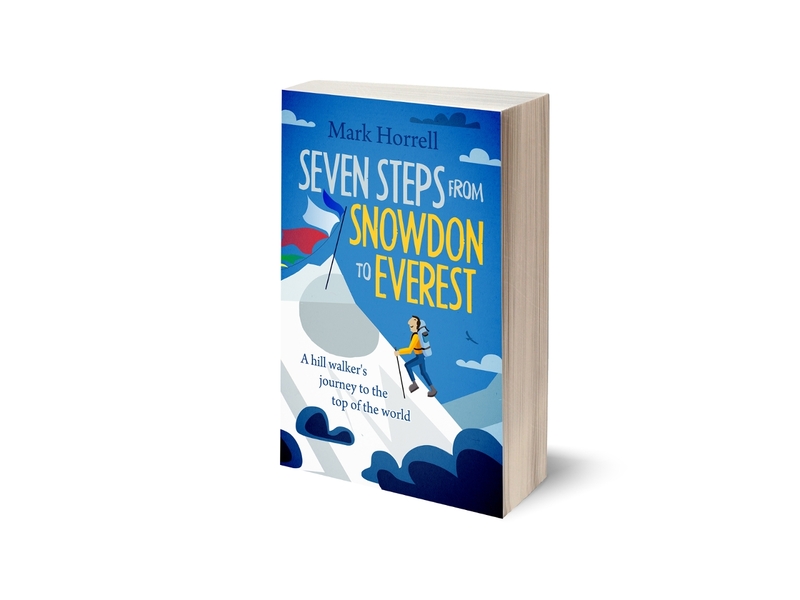 It was shall I, shan’t I conditions, but I felt more comfortable negotiating the rock sections in my crampons, than traversing the snow slopes without, so we put our crampons back on again. I’m sure it was the right decision. 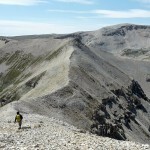 Although the ridge looked difficult, somehow there was always a wideish path close to the crest, until we reached the base of Monte Camicia and the route steepened. We traversed beneath a rock pinnacle, then the path doubled back up to the ridge. We scrambled up a rock section where a couple of pitons had been driven into the rock to step on. I noticed one of my crampons was falling off. This was a consequence of continually twisting my foot onto its side as we scrambled over rocks. Here we reached what may have been the small rock band described in the guidebook. Edita climbed it effortlessly while I was putting my crampon back on. I had a little more trouble, and ended up having to ask her to come back and tell me how she did it. It was a smooth rock with not many handholds, and an airy drop down what seemed like the full 1,200m of Monte Camicia’s fearsome north face. Crampons and smooth rock aren’t ideal companions, but with the help of Edita’s instructions and only moderate swearing I managed to get my leg up it. I took over the lead. 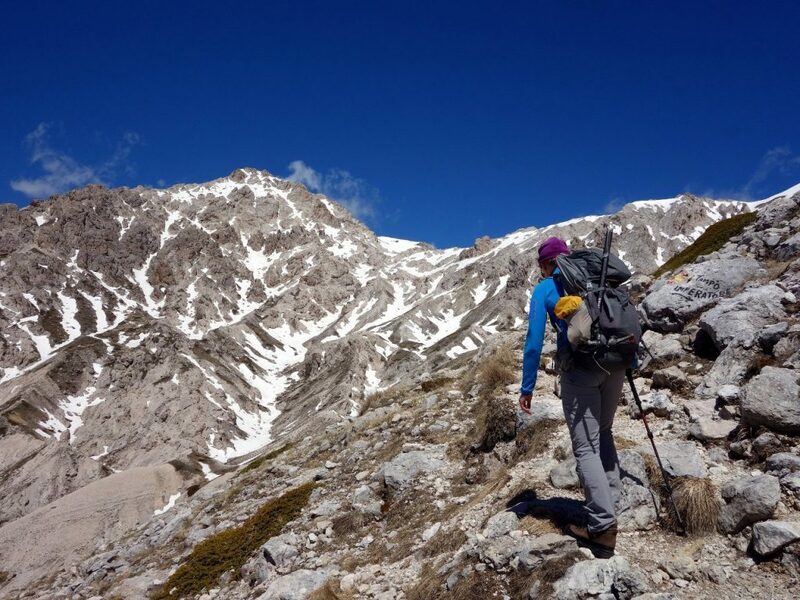 We walked across some more rock, then along a snow ridge, underneath a waterfall, which led to what had always looked like the crux of the climb, a mixed snow and rock gully. As we were approaching this section, for some unfathomable reason, Edita decided to yell in enthusiastic fashion behind me. Given that we were approaching the crux of the climb, and we couldn’t see that there wasn’t another crux above it, or indeed another crux above the other crux, I felt this was a little premature. But I had exhausted most of the swear words I knew on the previous scramble, and as my brain was mostly concentrating on the route ahead of us, there wasn’t space in it to think of another one. So I had to respond politely instead. To begin with the gully had enough snow for footsteps, and it looked like some of the skiers had come this way earlier. The snow had melted a bit since. It disappeared for a few metres, and I had a choice of three rock gullies to scramble up. My mind wasn’t functioning perfectly, and I chose the hardest one. It wasn’t made any easier by the fact that I was wearing crampons, and waving a trekking pole in one hand and an ice axe in the other. Behind me it appeared that Edita was finding her trekking pole as much of a nuisance as I was finding mine. “I’m going to throw my trekking pole up to you,” she said. With hindsight I probably could have been more polite, but it convinced her to keep the pole in her hand. Eventually I found myself on a rocky promontory which provided access to a much bigger snow slope extending as far as the horizon. It looked like the crux was done, but Edita was still behind me, and she had one more surprise in store. Perhaps influenced by my earlier reaction, as she was climbing up the lip below the promontory, she decided to dispense with her ice axe altogether. She hurled it up the rock face onto the promontory, hoping that it would stay there without sliding back down the gully she had painstakingly ascended, and then hurtling down the north face. By a miracle it rocked like a see-saw for a few heart-stopping moments before perching gently in place. My barrage of profanities was arrested by a gasp of relief. I walked back down to the promontory, picked up the axe before it got caught by a gust of wind, and extended my own ice axe for Edita to hoick herself up on. It was now approaching six o’clock, with perhaps two hours of daylight remaining. We had burned our bridges, and couldn’t return the way we had come. I was concerned that if the other side of the mountain presented as many difficulties as this one then we would be descending in the dark without a head torch. But now Edita was able to calm my nerves considerably. She had come up that way two years ago, and was able to confirm that it was just a walk. We now had just the snow slope ahead of us. We ascended the last few metres with our hearts smouldering in satisfaction. The summit of Monte Camicia lay at the far end of a wide stony plateau. We reached it at 6.15. The view back to Monte Prena beneath a late-afternoon sun, with Corno Grande wearing a crown of cloud behind it, was one I will remember for a long time. 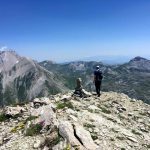 It had been one of our best walks in the Apennines, and we now had no regrets about doing the full traverse. The eastern end of Campo Imperatore was a pocket of emerald green far beneath us, with the peaks of Maiella rising on the horizon behind it. From this position Campo Imperatore floated like an island above the lowland sea surrounding it. We were on a rocky tower high above everything. Evening summits are an amazing experience when you know you have no difficulty getting down again. It took us another two hours, but we completed it in daylight. It was easier with snow that we could run down. Back on grassy hillsides again we stopped on a pleasant perch a few hundred metres above the car park at Fonte della Vetica. We surprised a camoscio (chamois) and finished the second half of our lunch that we’d started on the summit of Monte Prena. At 7.30pm it was quite late to be having lunch, but it had been worth waiting for. As we strode back to the car park shortly after 8pm we could see that two camper vans were still there. They drove off just as we approached our car, the one remaining car in that wide expanse of tarmac. The timing was such that we think they may have been waiting for us. Perhaps they remembered seeing two nutters leaving with ice axes at 9.30am that morning. They were worried about us. But we were fine. We were more than fine. This was a walk that I will remember for a long time. We had timed it perfectly, and we had made some good decisions. These things make a trip like this all the more satisfying. Dear,I like you,your post & photograph. Waiting seven long days for another superb post.